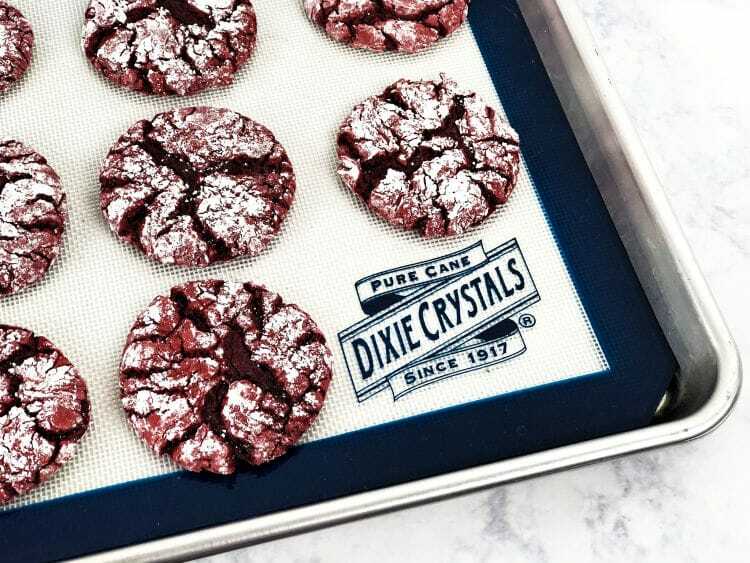 These delightful red velvet crinkle cookies are made with boxed cake mix. So there is less measuring, less fuss, and more time for laughing and eating cookies. 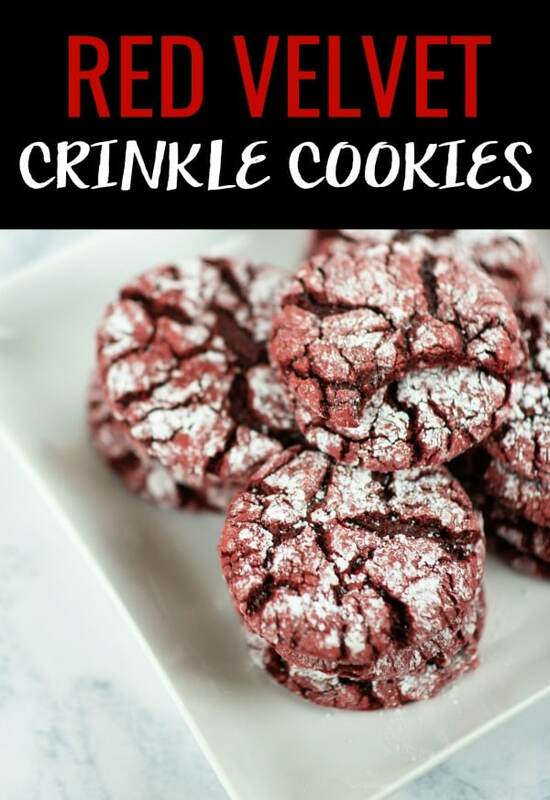 This Red Velvet Crinkle Cookies Recipe was partially sponsored through product samples for ChristmasSweetsWeek. I have a secret. These are not made from scratch. My favorite way to make anything red velvet is to use a cake mix. It might seem like cheating a little bit…and maybe it is…but you just can’t deny how amazing they turn out. And if I can save time in the kitchen, I will. These really do turn out oh so perfect! I love packing one in my kid’s lunch and imagining their surprise as they find our favorite cookie inside. They are so vibrant and rich. They look stunning on a plate of Christmas cookies or on a serving tray at a party. The recipe is below. First, I’m going to answer some common questions I’ve received about them. How long do crinkle cookies last? These have a fantastic shelf life. In fact, they will stay good on the counter for much longer than it will take to eat them all up! Store the crinkle cookies in an airtight container and they will last 2-3 weeks. 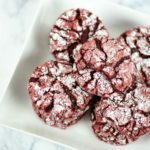 What are red velvet cookies? Red velvet is a cake flavor that is mostly chocolate. Some people say red velvet has its own unique flavor. Others argue that it’s just chocolate with red dye. Either way, these cookies taste like a birthday cake and I adore them. 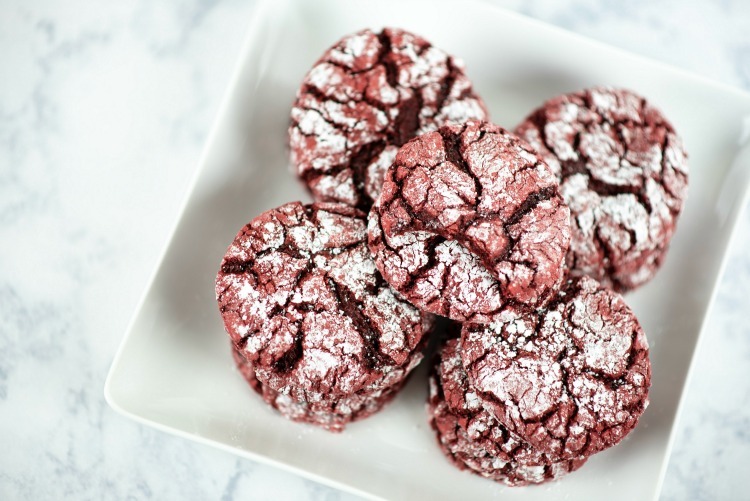 To make eggless red velvet cookies, you’ll need an egg replacement. Lots of people are fans of Ener-G egg replacer. In fact, Ribbons to Pasta has a wonderful eggless recipe. 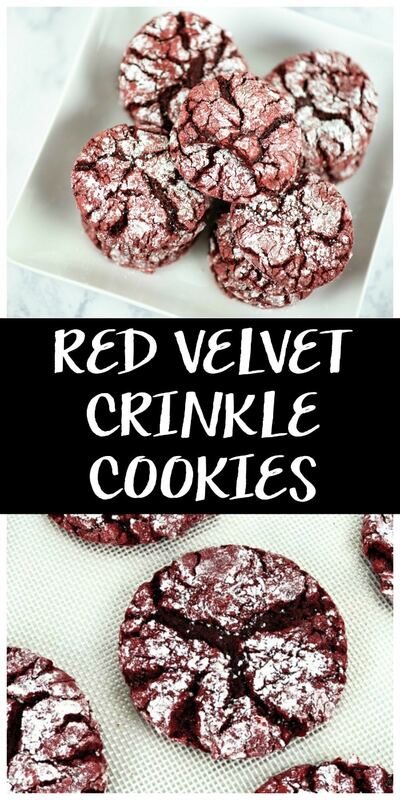 Here’s my red velvet crinkle cookies recipe. Print this recipe card and save it to your food board on Pinterest. You’ll definitely want to make these again. Mix powdered sugar and cornstarch in a small bowl and set aside. Then mix all other ingredients together until well blended. Using a cookie scoop, make dough balls and coat thoroughly in the powdered sugar mix. Place on a lined or lightly greased baking sheet. Bake for 10-12 minutes or until set. Cook for less time if you want a chewier cookie. Cool for 2 minutes on the baking sheet before transferring to a wire rack. « Easy Red Velvet Fudge Recipe – No Baking Needed!